Your next BMW Log-Book stamp doesn’t have to come from the BMW Service Centre. They are fine however they can be hard to get to, drop the car off and then pick it back up again. Lube Mobile’s fleet of mobile mechanics can meet you at your chosen destination and at a time which you prefer to carry out any and all standard Log Book Services on a range of BMW models as well as yearly BMW Car Service as required. Our fully qualified technicians use only BMW specification level of quality parts or better and ensure only the highest quality and correct specification oil and greases are used on your vehicles. We can stamp your Log Book without affecting your BMW statutory warranty and keep your service history up to date. Service Light or reminder on ? Your BMW systems can determine via Km's travelled and driving pattern which items you are due for. We can check your car on site and let you know exactly what you need. Oil Service: Inspection I: Inspection II Service - These can vary by model, so we will check you car and provide written quote on what your car needs. 3 Year Service – 45 000 km service keeping your BMW brake fluid and air filter tip top. We have experienced and fully qualified mechanics who know BMWs. We’re familiar with a range of new and older models from the 1 Series, 3 Series, 6 Series, M3, X3 and Z4. Your BMW is in safe hands. Knowing your fixed price service ahead of time will ensure your vehicle and running costs remain in your control. Our mechanics will advise ahead of time what they’ll be performing and advise of any additional works required or recommended for peak performance before they commence. We also perfrom a variety of repairs on BMW. All the common items such as battery, alternator, brake pads, starter motor, radiators plus much much more. 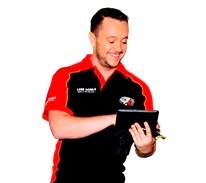 Contact Lube Mobile today on 13 30 32 or enjoy the even great flexibility of an online booking system available 24/7. With your BMW’s model and year we can have a service, mechanic, time and destination booked in for you in moments. Very organised mechanic - explained the work he was carrying out on the day & in simple terms. He had great communication skills and was very professional. I will continue to use Lube Mobile for my vehicle. Keep up the good work guys! I was a little apprehensive about using your service as my BMW had always been serviced by BMW. However I found this service of a higher quality than I had previously received from BMW. The technician explained everything thoroughly and seemed more knowledgeable about my car than the BMW service department. He explained everything that he was doing and gave me options. Would definitely use again and recommend to others. The lady I spoke to on the phone that arranged the work and gave me a quote did very well and is streets ahead of your competitors. Did a great job promptly and competitively priced. I was more than happy with the whole experience. Well done. Keep up the great work! 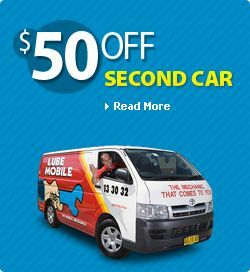 Your service is great for people who work and haven't got time to run around looking for a service centre for a repair - I would highly recommend Lube Mobile any day. Before any car repair is commenced we present you with a written estimate for your approval. This keeps you in control when you use Lube Mobile for lob book service. All parts and oils used are of the highest quality and equal or better manufacturer quality. Our technicians work 6 days a week and accept EFTPOS, Cash and all major Credit Cards. Observe all work being done on your car - Don’t be kept in the dark. Deal with the person actually doing the work. All our mechanics are fully qualified. Why wait, we can offer same or next day service in most cases. Call our friendly staff on 13 30 32 if you have any futher questions, get an online quote from us now to compare our prices - or book service online.